GALION — The Comfort Inn on Ohio 97 was a pitstop last week for members of the Midwest Brass and Gas Touring Club. Galion was a comfort stop. Members of the group, based in Michigan — but with members from as far away as Phoenix and Canada — stayed here last week as the group embarked on its 2018 Summer Tour. The vehicles arrived in Ohio in trailers — big, plush trailers — that spent the week parked behind the Comfort Inn. Some members parked their cars in the trailers at night, others left them in the open, in the parking lot, for others to enjoy. 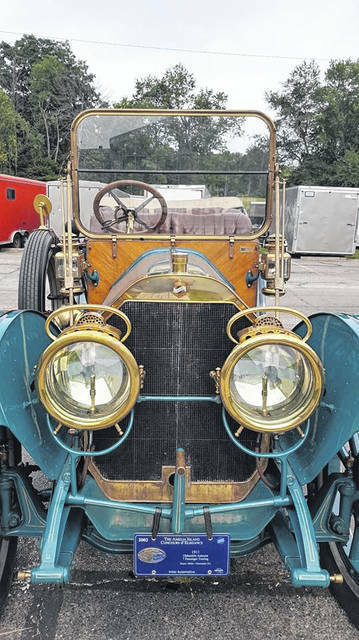 The vehicles — this tour included cars manufactured between 1908 and 1912 — are lovingly cared for. On Thursday morning, about 75 members of the group loaded up around 30 cars, and took a tour of north central Ohio. The day’s first stop was in Galion, where they parked their vehicles at Galion First Lutheran Church and enjoyed some coffee and donuts. They also shared stories about their vehicles and posed for photos while meeting with interested locals. Chuck Sharpe is from Highland Michigan. Most have a huge affinity for old vehicles. It’s not easy to plan one of of their tours. 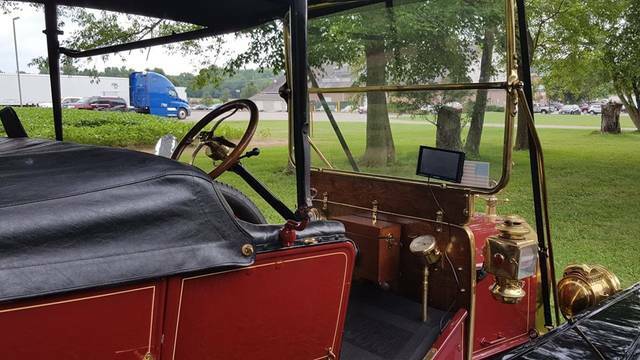 Sharpe was driving a 1910 Buick Model 17 . The group averages maybe 80-90 miles of travel each day, stopping in several communities or a local attractions during their commute. 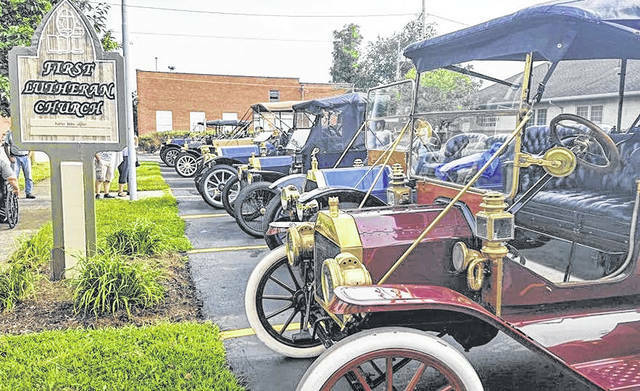 Some are dressed in period pieces to match their vehicles.. After their stop in Galion, they returned to Richland County. There were visits to the Ohio State Reformatory, Plymouth, the Blueberry Patch in Lexington and more. Each of the cars travel at its own pace and at each stop, drivers and riders meet with curious observers and talk about cars. Sharpe — for obvious reasons — favors cars made in Michigan. “This one was made in Flint, Michigan. New, even in 1910, this one cost $1,7oo to $1,800,” he said. Then he explained that in 1910 cars sold for an average price of about $950. Then Henry Ford came along and changed the industry with the use of assembly lines, and the mass production of parts. Cars taking part in this tour were built between 1908 and 1912. They included Model T’s, Buicks, Hudsons. Pierce Arrows, Mitchells and more. You can see more photos of the cars in an online gallery at www.galioninquirer.com. More pictures, from the Comfort Inn in Bellville are online at www.thebellvillestar.com.